One of the requests I receive often is to write a post on building a vegan pantry, providing a list of the ingredients that I use the most. I’m a bit embarrassed by how long this post has taken me to put together, but as they say, better late than never. Or is it better never than late…heh. This post is by no means exhaustive (nor do I think you need all or even most in your own pantry), but it does highlight many of my favourite foods that I have relied on for about 3 years now. Feel free to use it as inspiration for your own pantry. I also haven’t included vegetables or fruit because my favourites tend to change based on the seasons. Underneath each photo, I’ll list the name of the foods from left to right. You can also click on each picture to enlarge the photo if you wish to have a closer view of the product. 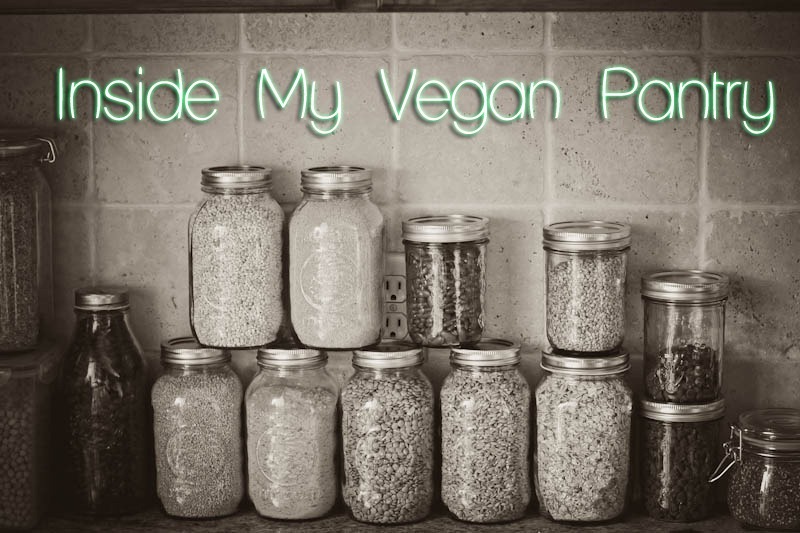 This post will also be linked from the top of the blog (see: “My vegan Pantry”) for easy access. You’ll find a printable PDF at the bottom of this post so you can print the list out and bring it to the store as a shopping list if you want. I hope you find it useful. My best tip for building a pantry is to buy in bulk whenever possible whether in store, online, and/or via a buying club such as with ONFC (see my note below for discussion). One of the great things about eating a vegan or vegetarian diet is that many of the staple foods we enjoy cost just pennies per serving. Once you have a good base of grains, spices, and legumes built up the rest is just icing on the cake. Buckwheat is in a class of its own. It can be used just like a grain, but it’s technically a fruit seed (and often called a “pseudocereal”). I buy Raw Buckwheat Groats, which differ in flavour from kasha (toasted buckwheat). Personally, I prefer the flavour of raw buckwheat. One of my favourite ways to enjoy raw buckwheat is in this raw, no cook breakfast porridge. It’s sooo good and fun for spring and summer mornings. 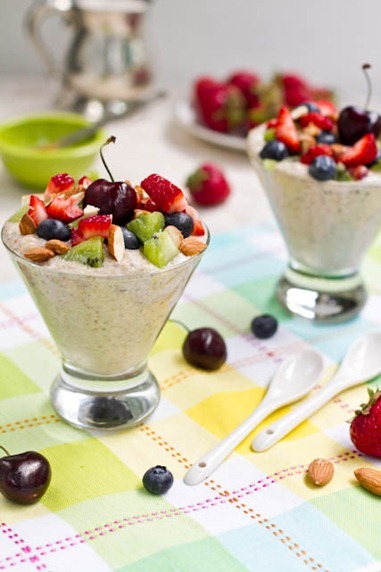 You can also blend it up at night and there is no work in the morning, similar to vegan overnight oats. Occasionally, soy-free Earth Balance in the red tub. At first glance, you might think that sugar is vegan, but unfortunately some brands use animal bone char to whiten the sugar. Yet another reason to move away from refined & bleached white sugar whenever possible. I’ve also recently discovered coconut sugar, but I’ll be talking about that in another post. Chocolate certainly deserves its own category! Finally, my spice collection- which went from virtually nothing 5 years ago to a big and growing collection at present day. My love for spices grows as I experiment more in the kitchen. There is never any need to eat boring & bland food on a healthy diet. For a printable PDF of this list, click here. Finally, I’d love to have a discussion about vegan-friendly stores (both online and in person) to purchase food products. I think a list of resources would be wonderful for new vegans and long-time vegans alike, especially when price-comparing and trying to save a few bucks. If you’d like to join in on the discussion and offer your suggestions or even ask a question on where to find something, feel free to do so below! I will help as much as I can and I’m sure many of you have great pieces of advice too! I buy brown rice flour from Bulk Barn, not sure if you have one near, but bulk food stores should have it. Also check the natural food or GF section of grocery stores. As for BRS, I buy mine from ONFC usually, but you can find it in many grocery stores (check in the natural food section), health food stores, Whole Foods, and online. thank you, Angela! I tell you, living in the USA sure makes me want to start a Bulk Barn here because you get so much of your fun stuff from there! Not sure why I’ve not thought to look online, thank you! Bulk Barn and President’s Choice are what I miss most the past 11 years living in the states. Not sure if you have a Kroger’s or Fred Meyer’s near buy, but their organic section now carries brown rice syrup! I have just bought some from Sobey’s, a New Brunswick store. Jasper, I’m not sure what stores are near you, but I can find brown rice flour in bulk at Fred Meyer/Kroegers. The Krogers we have here in NC don’t have bulk bins, though I wish they did! I am heading to WF to look for some today. Thank you Lisa! www.iherb.com They have EVERYTHING all natural from groceries to bath products! Use not575 on your first purchase and receive 5$ off! Promise I’m real, they’re an awesome site. Where do you find your jars? The largest size I’ve been able to find locally is quart size from Walmart. But I’m unable to fit a measuring cup into those to scoop out flour. I’d love to find some larger jars especially for flour, possibly rice too. Thank you, glad you find it helpful! I am definitely printing out your list! I love posts like these to give me some new ideas when a rut inevitably pops up! I love this post and would love a discussion about where to buy and price comparisons. For me, that’s the biggest hurdle to vegan eating… some of the products just seem ridiculous in price! Thanks for the suggestion. I agree that would be very helpful! Once I started making my own nut butter, I rarely buy it from a store now (with exception to sunbutter because I’ve had too many sunflower seed butter disasters in my food processor…lol). If you have a good quality processor, I would say to try it out. It’s easier than it seems and I have a few recipes on my blog (raw almond butter for a basic one or try roasted almond butter with hemp, flax and chia) I will make a batch and it lasts a long time in the fridge. 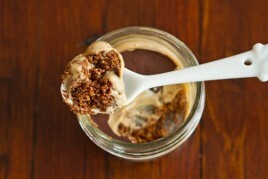 I made a batch of nut butter for a recipe in my book and it has lasted almost two MONTHS in my fridge. I like to buy nuts in bulk to save even more money. For quinoa, I buy it usually from Ontario Natural Food Coop, you can get a membership if you have a food biz or you can participate in a buying club. Crazy good deals from them. I imagine you can find it online for cheaper than in stores, but I havent looked for that yet. It would be nice to find out who in your own area is in a coop that we could join. I looked into one once but you needed to get a group together which I found difficult. I noticed that you mentioned that you sometimes make your own coconut butter. Seeing as you have a vitamix, have you ever tried making your own coconut milk???? If so, what did you think?? I am impressed that you tried to crack a coconut….but I am talking about making coconut milk from dried coconut with your vitamix. It works quite well. I am still experimenting but right now I am doing 1/2 cup dried to 1 cup of water – 2-3 mins in vitamix on high. Strain out pulp like you would yogurt. (I use a permanent coffee filter rather than cheesecloth). What’s left over once dried is coconut flour. 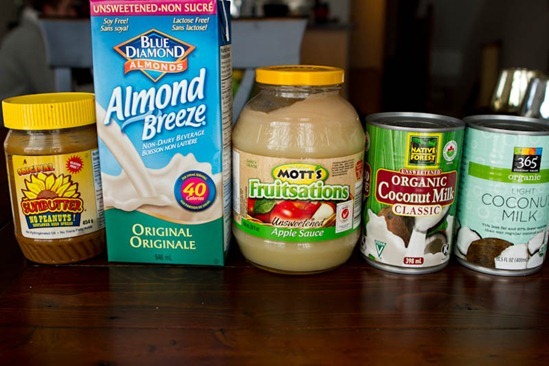 As I make only what I need at the time, I just throw the pulp in my morning smoothie….no waste. Here are a couple of websites explaining the process in more detail. The first one is where I started. Each person uses different ratios of coconut and water ( yesterday I noticed on a commercial box of coconut milk a 60:40 ratio of water to coconut)…so anyway if you want to try it start small… find your bliss….. Beats crackin’ a coconut…. Aw that sounds easier than what I was thinking! I will have to try it out. Thanks Lea! 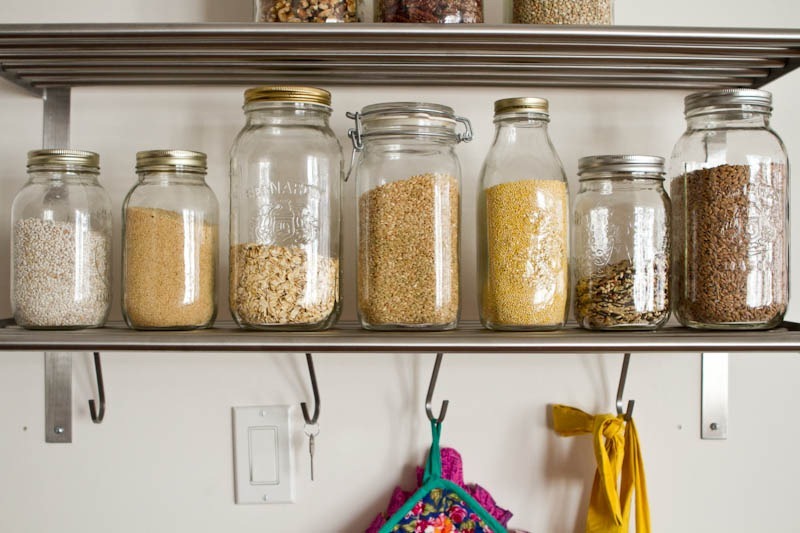 Your new pantry shelves really display all the glass jars so nicely! I always try and comment on posts like this to say that red kidney beans are probably something to avoid cooking from scratch – they are toxic and if cooked improperly (like in a crock pot or at too low a heat) will make you VERY sick. They are the one bean likely best purchased canned, just to be safe! As long as you soak them for 5 hours, bring to a boil and boil for 10 minutes with some baking powder, then rinse and boil again for 40 minutes or longer, (which is standard procedure for all dried beans – boiling times may vary) you won’t have a problem. It’s only a problem if you eat raw beans. Some canned goods contain BPA, and dried beans are so cheap it makes no sense to boycott red kidney beans. Just boil them properly. I have boiled them so many times and never had this problem. You’re totally right, but I think a lot of people don’t know this! I sure didn’t and I had a bad run in with them and only after google-searching what might have made me sick did I learn about it. So weird! Thanks Eve and Cyndi, great points worth sharing. agree, I buy from them too and the savings are huge. Def. check in your area (even if outside of Ontario) for buying clubs. Any idea how to find out if there is already an established buying club in your area? I definitely don’t have the time to start one, but would love to join one! My pantry looks pretty similar to yours actually! Guess I eat pretty vegan even though I’m not LOL! Your pantry is my dream pantry!! So organized, with so many wholesome foods!! I’d love to know where some of the best places in Toronto to buy vegan products. I would try whole foods, but it’s a bit far from me, and some of the prices are quite high. Any tips for being a vegan without breaking the bank?! Thanks for your suggestions Michaela! Im putting together a list now and hope to put it up on the blog at some point. I think our pantries could be twins! I also keep chickpea flour, chia seeds, and peanut flour on0hand at all times. Where do you buy peanut flour? Thats something I’ve never come across in Canada. Thank You for opening up your pantry to us readers.Mine looks similar to yours and still growing.. Everything i have in my pantry comes from reading your blog over time and trying out the recipes, at first i thought that is way to0 expensive, but in the end i realized that it is cheaper and healthier. Your an amazing and inpsirational person . I haved changed my eating all because of you..I dont consider myself vegan although that is the way i eat 90% of the time..there is no label to how a person eats. I was at Qi Natural Foods ( located between bathurst st and Allen Rd along Eglington avenue west.Toronto. (416-784-0459) last thursday and i think i saw the peanut flour or PB flour .not sure if it is the same thing.You can call to confirm. Here is something to try also. Coconut Nectar(-_-) It resembles Brown rice flour, Its gluten free 100% Organic, GMO Free, Fat Free and vegan. its a low gylcemic sweetener. i use it in my pancakes and topping for my oatmeal…. Just thought i would share that with you….Have a great day. I wish we had TJ’s! I haven’t been able to find it in Canada so I order it online. I use it ALL the time. So worth it! I’ve found it at Asian/Indian super markets. What a great post thanks so much! Thank you for this list! So helpful and the mason jars idea is great! you and your blog are such an inspiration to me. I turned vegetarian recently and am still reading and googling a lot trying to figure out nutrition facts and how to keep a healthy and balanced diet. Things like how much beans, nuts, seitan or tofu in a week, which foods to combine, etc.. I regularly visit your blog searching for recipe inspiration (and am always amazed by your delicious creations) but now I was wondering if you would like to share, from a personal experience not from a nutritionist/dietist point of view, some tips about eating correct proportions of each nutrient. What is your meal planning like? I think a real report from a regular vegan person would add so much information to any vegetarian/vegan books written by doctors. Sorry for bothering you so much.. :) but I also wanted to ask you one last thing. I searched on your blog more information about tofu. Like you, I tried it a few times and didn’t like it much, but I want to give it another try. In my local grocery shop they have tons of types, and my head spins trying to understand which one I should go for and how to cook it. I read that seitan contains some amino acids which might cause calcium loss so it’s recommended to have it max 2-3 times a week. This is why I got more curious about tofu, which seems to be fully healthy compared to seitan. Do you have any suggestions about tofu? Thanx a lot again, I wish you a lovely day. Thank you for your kind words! That means so much to me. :) Congrats on your recent shift to vegetarian too. As for meal planning, I don’t do it. Is that weird? haha. I just find that I never make time and I’m not a big planner when it comes to my personality. Regarding tofu, I’ve had a lot of duds with certain brands and ever cooking techniques. I say, keep trying. I find some firm tofu brands aren’t really that firm….you just need to test some out to see which you like. The really firm ones will press wonderfully. I like a simple pan fry or to really impress- try out my breaded tofu strips…my all time fav. Take care! I need to work on organizing my pantry, yours looks amazing! Costco is great for many vegan friendly staples- I just picked up a 32oz jar of MaraNatha almond butter at a price that made me very happy. I also purchase my medjool dates, a variety of nuts, and other unsulfured dried fruits from Costco. Yes Costco has a big selection for foods like that. So helpful! I need to invest in jars like yours and also need to get my spices organized once & for all! I love how organized you are! I love most of your pantry staples are in mason jars! It makes for such a clean and neat look! hah love that idea. :) I don’t mind the “chunk” aspect of them, but for some reason I find the mini chips taste better? This is great! I would love some help on where to buy bulk online. We recently moved to Pennsylvania and there are no big health food stores within 2 hours. Also, CSA and what to look for to find a good one. Wow, what a list. What’s your rule of thumb for deciding which sweetener to use in a recipe? Great question! How did you know I was just thinking about this the other day? It depends on a lot of things, such as what type of baked good I am making. If I’m making rice crispies or granola bars that need to stick together I’ll often go for brown rice syrup because it helps bind them. Traditional cookies- dry sweeteners usually to retain that crisp factor. Sucanat is great in cookies, but it can dry out other baked goods, so I use it with caution. Pure maple syrup is my go to for lots of baked goods, I find it so versatile and amazing in muffins and quick breads. Also great flavour. 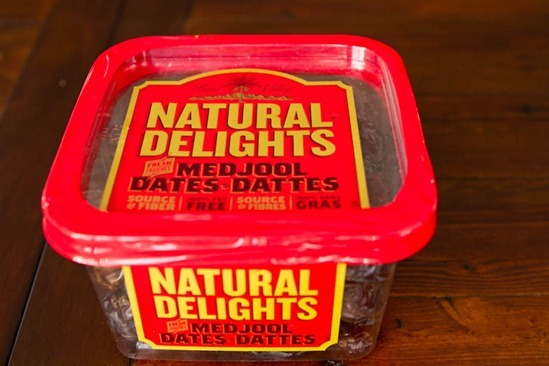 If Im making something no bake I love to use medjool dates…helps everything stick together and you don’t get a grainy feel from dry sugar. Does this make any sense? lol. I kind of just feel out my options when I begin and go from there. Or othertimes, I will be testing a recipe and try one sweetener only to find it didnt work out great and have to use another in a second trial. Yes, it makes sense. Thank you for the tips! How smart! printing this list to share with my “one day soon” clients! 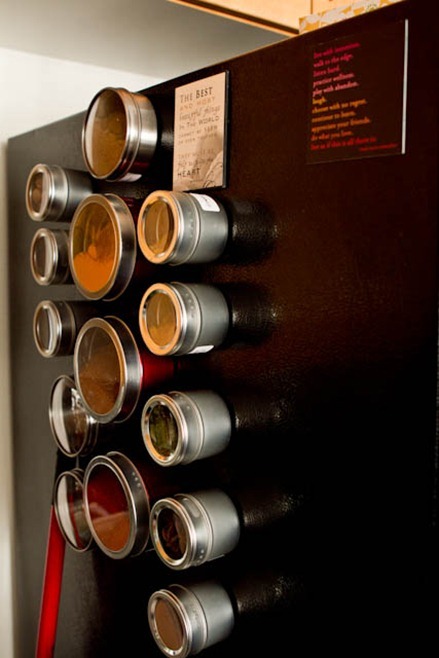 Do you actually write on those little spice jars or add labels to identify what they are and the date you got them? really great idea, as i am always shuffling through my drawer! Yes I write the name under the lid on a sticky pabel…unless it’s a really obvious one like chickpeas or whatnot. Hi, I have spent weeks looking at your facebook and many other pages/blogs like yours… I am so overwhelmed by the clean eating and/or vegan lifestyle. So much so that I have not bought a thing. Could you put together a simple breakfast lunch dinner and maybe some snacks. I don’t mind eating the same thing everyday until I can learn more and buy more. This is actually a great idea for a post! Thanks for the idea. I definitely understand how overwhelming it can be. Dinner ideas: 15 minute creamy avocado pasta is always an easy one with minimal ingredients or see these recipes for more: http://ohsheglows.com/recipage/?search_term=entree&ui=133&c=1 The Creamy Tomato Barley Risotto is another go-to of mine. If you are looking for a suggestion for another post, I would love to know how you suggest readers can better find the time to cook healthy. I realize you are around the kitchen more than most considering that you are working on the cookbook, but as a single mom working fulltime and commuting from Oakville to Toronto daily, I am running into real trouble having a wide variety of healthy food available when I want something without spending most of Sunday in the kitchen prepping for the week or buying expensive and questionably healthy pre-made foods. I know some things I can freeze fully cooked, but what recipies work best and are quickest to defrost, or even better can be eaten semi-frozen? What lasts in the fridge for several days? And considering I am sitting here with a not too healthy sandwich in front of me at the moment, what can I pack for a brown paper lunch that won’t get soggy or linger in the stale office air or on my breath for hours? Your suggestions (possibly in a post or series of posts) would be greatly appreciated. Thanks – I’ll definitely search them out! Thanks so much for your comment. I can certainly imagine how difficult it is for you juggling everything that you are. Kudos to you for making such a big effort to eat well even with a hectic schedule. I will definitely put my thinking cap on. I tend to fall off the healthy dinner train relying on packaged foods too much and so this is something I have been thinking about too. Thank you for that helpful list. We appreciate the work involved. Someone asked about sources and prices. My Costco doesn’t serve me well for a lot of my necessary items, especially organic. I find several bulk items at Amazon (Food and Grocery) but I like Vitacost.com, too. They have a huge selection of staples like oils – as well as nice palm/soy candles etc – at much less than retail, with low flat rate shipping (at least within the USA). Thanks again, Angela. Great blog. If you or anyone else decides to try out Vitacost.com, here is my referral link which will give you $10 off your first purchase! I love getting things like whole wheat pastry flour and other vegan snacks that I can’t get in Mississippi. Oops forgot to give the link lol. This is awesome! I’m going to print the pdf…thank you for putting this together. For whatever reason seeing it pushes me toward making it more of a reality. Do you keep your flours and nuts in the fridge? I have read mixed reviews about this online, thanks! No I don’t usually and to be honest I haven’t read up on this much. I tend to go through things quickly so I guess I don’t bother too, but now you have me intrigued to read up on it more. I do keep hemp seeds in the fridge now though. All my stuff (flours/nuts/seeds) are in the fridge or freezer. I read your supposed to too, but it does take up a lot of space! Oh I’m SO glad you wrote this post because it’s incredibly helpful. Trader Joe’s has some great vegan products (my favorite is their edamame hummus and unsweetened dried mango). Thankfully I have one close by but they aren’t too common out in Colorado and I don’t believe they have any locations in Canada, though I could be mistaken. I’m glad that a lot of regular grocery stores now have organic sections where you can find a lot of vegan products. I absolutely love trader joes! Their website has a vegan product list I believe. Also, their products are so clearly labeled vegan! Great post, Angela! Very helpful! This is great to get people started on stocking their pantries. I love to shop my local food co-ops for most of my bulk grains, legumes, spices and baking staples. You can often grind your own peanut, almond or cashew butter in the store. Amazing, looks great and very organized. I have been meaning to do the same. Thank you for sharing. Post more. Visual post have more impact and it is easy to follow/ copy. What a great reference- even if you’re not vegan. Gives me a great list of things to stock up on and new things to try! Oh wow I haven’t been there, but would love to go! Is it open year round or just during warmer months? It’s open all year round. There are specialty shops, great restos like Urban Herbivore, bakeries, and other ethnic food shops. There are a couple of great grocery stores too that carry all the organic packaged foods and beauty/home stuff for WAY cheaper than Whole Foods. I recommend going on a Sunday morning. On Sundays cars aren’t allowed so it’s great to stroll around! It’s my fave thing to do in the spring/summer! Car-Free Sundays in Kensington only run from May – October, on the last Sunday of the month. Thanks for a great blog and fabulous recipes! I’d like to suggest that, when arriving home with beans/legumes/grains that they be stored in the freezer initially for 48-72 hours. Whether organic or commercial, freezing reduces the chances of one day finding your pantry infested (ugh, the hair on my arms just stood straight up from the memory!). Really? I hadn’t heard of that before, but I will have to look into it. Brittany just went through this! I didn’t know before either but I’ll be doing it now!! 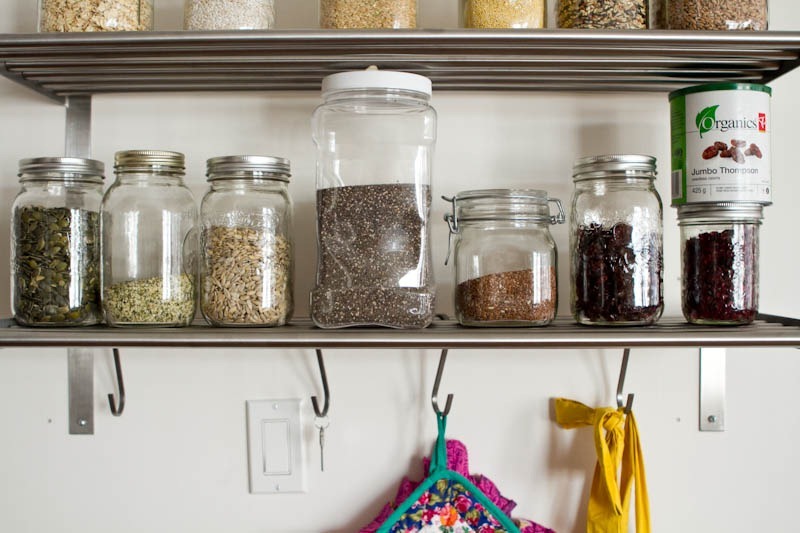 you have the pantry of my dreams… so organized, so healthy! So I have been putting them in upside down. Unfortunately the seal isn’t as good that way. It can be a pain but I find the most effective way to grocery shop is to hit a few stores. I find Trader Joe’s has most vegan staples cheaper than health food stores but we have a regional store called Fresh and Easy that has the best value on produce. More effort, yes, but worth it to have all the things I need without breaking the bank. And regarding expensive vegan items, most of those actually last a long time. Coconut oil, for example, was something I avoided for a long time because I thought it was too pricy but my $7 jar has lasted me for months and I probably use it every day. Think value over time. This is great!! Being and newbie and trying to transition this is very helpful. I have a handful of these items but certainly not all. I paid $5 for a bag of dairy free chocolate chips over the weekend! I put them in healthy muffins and my kIds will eat them for breakfast and snacks. I would love a shopping post to comPare prices or even if you listed your price points for items that would be helpful to know if I’m getting ripped off or not! I have a Trader Joe’s close by (walking distance, and I don’t have a car) so I get most of my food from there. I bought organic chia seeds from Amazon once (they have an automatic delivery option that saves you 15% or so each time). I also get Pacific soy milk from there (it comes in boxes of 12 tetrapaks). OMG! I wanted this exact post since I am planning on stocking up at Whole foods tomorrow! Perfect. Also, was that a lemon poppyseed loaf I saw on yesterday’s post? Please say yes. I always keep Bob’s Red Mill gluten-free flour on hand in case I’m baking from Babycakes recipes. I also keep xanathan gum, arrowroot powder, spelt flour and applesauce on hand because those recipes frequently call for them. 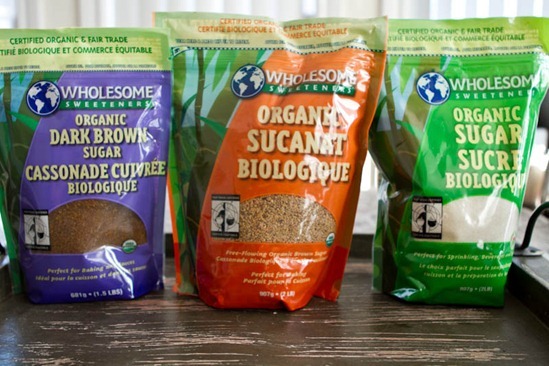 If you’re in Calgary – you can get them all from Community Natural Foods in the bulk section. I love Trader Joe’s, Whole Foods and Amazon for pantry items. We use our Vitamix every day for fruit and veggie smoothies. So much better than a blender and easier to clean. Any suggestions for tasty protein powder or bars? I have tried several Vegan ones but they all make me gag. Wow, this is a great post!! It must have taken you so long to do but it is awesome. Thank you so much! I usually find myself feeling overwhelmed at stores while trying to buy the basics and staples for a well-rounded vegan diet, and then always forget something. This is definitely really helpful! What a great resource! Envious of your supplies, especially the spices! I moved awhile ago and had tons but didn’t restock. Anyhow read that they are best within 6 months anyhow so moving is a good time to refresh those. Wish I had those lazy susans too. Where have you found cocoa nibs? i can’t seem to find them at ANY whole foods i’ve been to! I bought them from Ontario Natural Food Coop…but yes they can be hard to find for sure. I love this post! Great basic knowledge and ideas for beginning vegans. Thanks! Costco is where I get a few staples (almond butter,quinoa etc) for the best price I’ve found. We don’t have a bulk barn here in Victoria but I really wish we did! It would be amazing if the vegan-friendly stores discussion could be international, so readers can find out about stores in their countries they may not know about! Anyhoo – THANK YOU for this post. I am moving in three weeks, and I wanted to do a total stock up of a Vegan Pantry and this helps a lot. Can you believe that Calgary does not have a Bulk Barn. (so sad). I have a question re: your spices. I heard that it is actually better to buy fresh spices and use, rather than used dried. (like not just herbs, but actual spices such as cardamon etc etc). DO you have a coffee grinder, or a place to get your own whole spices and make your own spice blends? I am a HUGE fan of Dreena’s. I think her ED&BV book was my first vegan book and she is definitely a big reason why I fell in love with the vegan diet. Glad to hear you enjoy her as well. Have you checked out her new cookbook yet? I haven’t had a chance to make anything but its FILLED with great info. I know Im going to love this one so much. As for spices, yes I do have a coffee grinder and do have some whole spices, but I don’t make enough use of it I’m afraid. I also try to use fresh herbs whenever possible. Oh, I do. (I was the last one to buy it off Amazon.ca hehe). I enjoy all four of her books, especially the book that has a chapter dedicated to hummus! Again, thanks so much for this list. :) it will totally help me out. I want to start growing an indoor herb garden for fresh stuff. to Danielle – making your own applesauce is quick and easy. (and you can control how much sugar you put in. I make mine with less than 1/4 cup of agave, because I add lemon juice/lemon rind to it). Stephanie – I’ve heard this too! :) I wanna try it! A hummus chapter…I know. She’s a woman after my own heart! Great post! I buy most of my vegan products at Earth Fare. They have so many great items and lots of bulk, which I love! If you ever have the chance, check one out. I found your page on facebook. We are trying to go Gluten Free as my nearly 4 year old son has just been diagnosed. Do you have many GF recipes? Glad you found the blog Kristy! 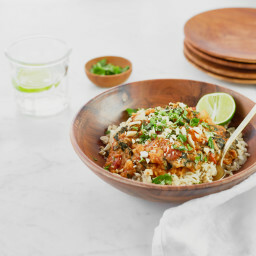 Here are many of my GF recipes or recipes with a GF option: http://ohsheglows.com/recipage/?search_term=gluten-free&ui=133&d=1 I hope this helps! Such a useful list! I also always have Beluga lentils to hand, I love how they retain their texture more on cooking. I also always keep a jar of toor dal, which is an Indian split pea type pulse that has been soaked in oil while dry. It makes the most delicious curries! This post is awesome. I especially love the pdf list at the end. Thanks so much for taking the time to do it. This list is very helpful. Where do you buy your kombu? and which variety? Its super expensive at WF. I came across your website around an year ago and love every dish thats green in color now. But still have to make my husband fall for green recipes. Any suggestions? I think I picked it up from a health food store while in the US, but I cant remember exactly where. It’s hard to find around here. Im not sure on the variety either, but I will check that out. Where do you get the raw buckwheat groats in Southern Ontario? I’ve tried a couple of BBs and only found kasha. I didn’t find it at a couple of the other natural bulk stores I tried either. This is where I buy them : http://www.upayanaturals.com/Buckwheat_Groats_Sold_in_various_quantities_Raw_p/nfl-0655.htm in a BIG 10 pound bag! Lasts a long time. This is such a fun, informative post! My pantry needs a makeover before posting pics! Haha! I also love buying my staples from Amazon and this site: http://www.vitacost.com/. xo! My first experiment begins with G and end with an A ;) any guesses? Yea on that recipe! I love using coconut sugar! This is great! Thanks for all the great information and ideas! I loved this post. And I loved it even more that you created a pdf document! I am recently switching slowly to a plant based diet, so this was the greatest timing. I’m glad you find it helpful Destini! Love it! So I live in Canada too and a smaller town so not a lot of choices sometimes. Do you have any favorite Canadian companies that you buy online from or other companies that don’t have crazy shipping? We could totally swap pantries! I have absolutely EVERYTHING you took pictures of! Great post! I am bummed to hear about brown rice – I ue the syrup often in granola and have been doing lots more gluten free baking so hae been using the flour. So discouraging when everything healthy ends up being not so! Look forward to hearing more about coconut sugar – just bought a case – but have yet to use it! Apparently, not all rice products are created equal from what I read. Depending on where the BR is sourced from, that will impact the levels of arsenic dramatically. I definitely want to look into it more. Your pantry is so neat! I love it! Where do you get all of your jars from? I would like to start organising mine in glass instead of plastic. I use simple Mason jars.. they look very similar to those in Ange’s photos. Super cheap and widely available in major grocery stores. Nice list, Ange! In Toronto, my favourite vegan-friendly store is Ambrosia up in Thornhill, but it is quite far away. Definitely has the best prices in the city. My closest store is better Bulk on Danforth which I rather like – it is often cheaper than The Big Carrot, down the road. Online, I like Upaya althoguh they can be pricy. If I lived in the US, I would buy from iHerb and Rancho Gordo more often (too pricy to ship to Canada, unfortunately). Thank you SO MUCH times a billion for this post. I literally wrote everything down (ran out of printer ink today!). I love trying new things, but don’t want to buy a regular sized pack of any item until I’ve tried it and know I’ll like it. How to overcome this? Angela, I know you mentioned in a post from the past on here that you did a lot of research before switching to the vegan lifestyle. What research helped you out? Did you have cookbooks to help you out during the learning process? Internet recipes and guidance? What do you use if you use Almond Milk with cereal for breakfast? It seriously causes gas in my system and it is bothersome all day. You mentioned in this above blog that you can combine something with beans to aid digestion- can you use that same ingredient with almond milk & cereal? Sorry for the question overload…. I’m still new to your site and actually found someone (you) that is willing to talk more in depth about the wonderful world of vegan-eating and more. Not to worry about the questions. I was there once too. 1) Why not contact the companies and ask for a free sample? I find certain brands are usually more than willing to offer a sample (or will happily send coupons) if you explain why you are hesitant. If they are confident in their product, it shouldn’t be an issue because they know you will eventually buy more! 3) Tofu- I find that tofu can vary a LOT by brand. I too have tried certain firm or x-firm brands that I hated. They just seemed so mushy and fell apart when I pressed them. I think it’s good to find a brand that you like. Sometimes it just takes a bit of testing. 4) Yes, the Oster blender is only around $40 and was rated #2 by Consumer Reports in 2010 (not sure what their 2011 study found). They rated it as second place next to vitamix. Worth checking out reviews of it on Amazon anyways. 5) I’ve never had that prob with Almond milk, but maybe it would be worth trying out other milks (oat, hemp, rice, or soy) to see if you digest those better. I love this! I’ve been building my vegan pantry for about 2 years now. I find something new that I don’t have in almost every recipe I try, which I love! One question though… Do you keep your nuts in the freezer? I always hear that you’re supposed to, but it doesn’t look like you do. I’d rather not, but will they spoil if I don’t? A few others mentioned this too, so I’m going to look into it. I do have the room in my freezer so I won’t be totally bummed if I have to make the switch. :) Will report back! Hi Angela! Great post. I use similar products and brands. If anyone lives in the Newmarket-Aurora area, Natures Emporium is amazing. They even have a raw foods chef, a bakery (lots of gluten-free and vegan goodies) and food you can take out or eat there (and it’s a grocery store, all organic produce). Just down the street is Ambrosia, which now has organic produce and is a little less $$ than Natures. Angela, Thanks for sharing all that you have learned. I have my raw buckwheat soaking for tomorrows breakfast. You probably have written about this, but right now I am on a strict ‘counting calories’ program to lose some weight. However, I have heard this before from greensmoothiegirl.com, but do you feel that when you eat healthy, whole, vegan foods, that your body takes care of the weight by itself? Does that make sense? I am excited about your cookbook, you are changing lives. Thank you so much for your kind words. :) I do think there is some truth to that. Since I stopped counting calories, I slowly learned how to listen to my own hunger cues and now my body found a place where it is happy to maintain. That will be different from everyone. A big thing for me was just accepting where my body was happiest instead of fighting myself to be a smaller size all the time. Also, eating whole foods never hurts. I find I have less cravings and more consistent energy levels than before. Goodluck with everything! love your pantry! and this is a great post. i usually buy things online too.. there are always some deals on amazon, iherb or other online stores. A lot of the grains beans and lentils come form the indian store. The best place to buy on the web is definitely www.iherb.com! The site doesn’t really look good at a first glance, but once you start browsing you realize that they stock tons and tons of vegan foods, protein powders, nut butters, flours, chocolate, oils etc… Not to mention all the vitamins that one could desire! If you’re a first time customer, you get a five dollar discount with the code KOS436. One protein powder I definitely recommend is Sunwarrior’s raw vegan vanilla protein powder. The protein bars by the brand Vega are another favourite. Another hidden secret of iHerb is all the natural cosmetics that they stock. There really is a ton of them! My favourites: the Hurraw brand of lipbalms (they contain stuff like cinnamon oil and are literally good enough to eat!) and the Badger brand of yummy smelling lotions and potions. This is such a helpful post Angela – and I can definitely see why it took a while to put together! Thank you for taking the time to do so. This is such a great list..thank you so much for sharing! I love so many of the same products!! Hi Angela. Great post. I was wondering how you keep track of expiration dates when you store the items in the glass jars. I usually don’t keep track by purchased date, but I just rely on smell to make sure it hasn’t gone bad before each use. I also go through things fairly quickly (like nuts with all the baking I do), so it hasn’t been an issue so far. I might store nuts in the fridge this summer though. I’m going to look into it more. Not sure if it was mentioned yet, but I was always told to keep nuts (and ground flax) in the freezer to preserve them. Good call on the wild rice blend too; I’ve already added it to my Whole Food bulk list. Thanks Autumn, a few others mentioned this so Im looking into it today. Take care! I love this post! I recently re-organized my pantry. It took going vegan to get me to get it in good shape! All those bulk bags lying around were just too messy and I just couldn’t find anything! 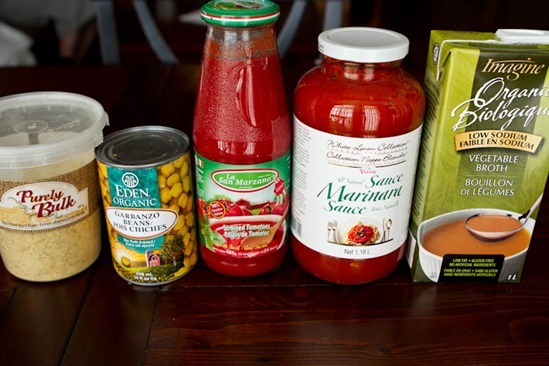 Great pantry staples! You make me want to re-arrange my cabinets and go shopping. The pictures are very inspiring. I LOVE your blog. It is so helpful. Wow, tons of great nutritious items in your kitchen! Love your organization and storage. I have just started eating and experimenting with some of these great foods. 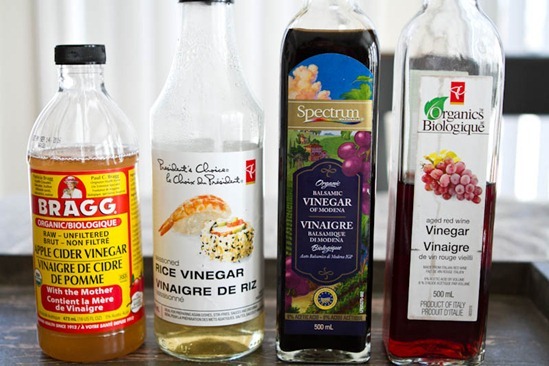 I was wondering if you ever use grape seed oil in any of your baking or cooking? Hey Kate, No I haven’t used it before. Is it something you use often? I use grapeseed oil in place of other oils in things like muffins, pancakes, vegetables, and frying certain foods. It is a light oil that doesn’t change the flavor of the food. Sometimes olive oil can have a stong taste when used for baking. Grapeseed oil won’t do that. It is high in vitamin E and antioxidants. Thank you Kate, I will have to try it! 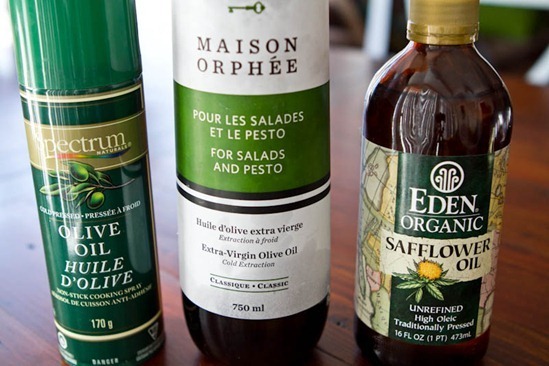 I love grapeseed oil for cooking up swiss chard, but haven’t used it for anything else. Can it be used for frying other veggies too? 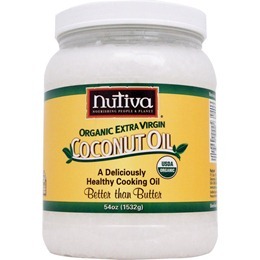 I use it mostly in baking but it can be used in place of most other oils for anything you would like. Cute! We are big fans of the mason jar look here in my kitchen. 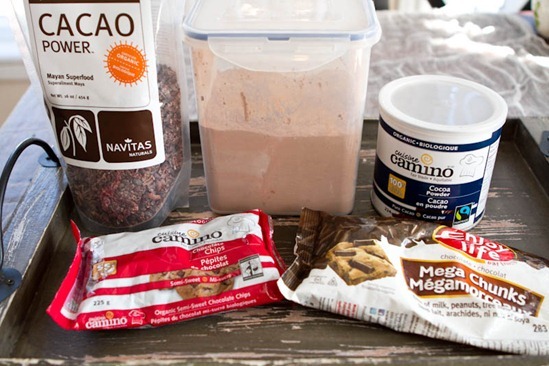 Looks like you have all the essentials there- especially the Navitas Cacao powder. We also sell that in my kitchen shop- it can be difficult not to borrow from it once and a while when I run out of my own! Thanks for sharing, such a sweet post. I just discovered pigeon peas this weekend, and I’m in love! My new favorite legume! Have you had freekeh? I had it for the first time last fall and it’s my go-to grain now. I use it instead of rice all the time. Such a helpful post!!! Love your spice collection! Thanks for the extremely thorough round-up. This is super helpful for the odd item I don’t have. 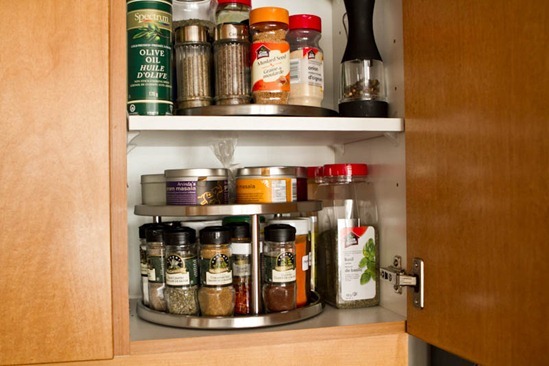 Btw, I use that spinning stackable organizer from Bed Bath & Beyond for my spices too! haha. I was looking for ages for something to keep them organized that would hold more than about 8 and fit in my narrow kitchen cupboard – that was the only thing I could come up with! Wow, that was quite a post! Thanks so much for all the great information and introducing me to some things I’d never heard of before. I still have yet to find hemp seeds at any of my local grocery stores. Do they sell it at Whole Foods? Our closest store is over an hour away but it might be worth it if I know they carry hemp seeds. Yes I think hemp seeds are in the fridge with the oils at whole foods. Not the cheapest place to find them, but an option if you are in need. I love how beautiful everything looks in the jars Angela. The hooks in the pantry are a great idea too. I think I’ll do that :) Thank you for the inspiration. Here is an awesome link for do-it-yourself labels for mason jars. You can make your mason jars look even more fabulous. Let me know if you end up labeling your jars – better yet post a picture on your blog! Awesome post Angela! So helpful. Question – I often find that I use a little bit of a can of coconut milk (for carrot cake oatmeal or something) and then the rest ends up going bad before I can use it up. Any suggestions as to how to keep the coconut milk ‘fresh’ after opening the can? I store it in an air tight container, but I usually just use leftovers in smoothies to get rid of extra milk. love your post. where did you get the spice holders? This is a super useful post. I’ve thought about this so many times… Wishing someone would do it. And I envy your pantry! Great post! Are all organic sugars vegan? I want to say yes, but I’m not positive. 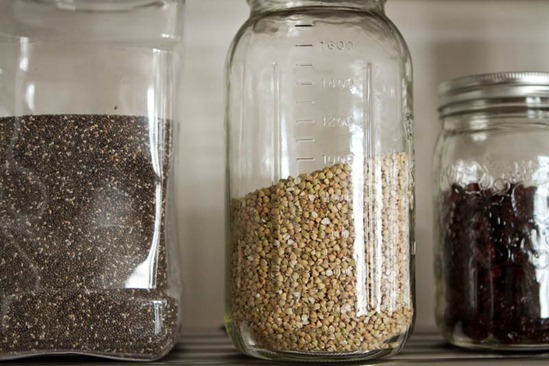 I absolutely love how you display your grains in mason jars! This is an awesome trick. 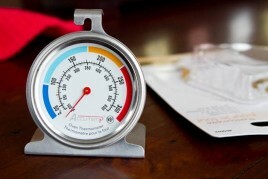 Helps with knowing what you have and it is aesthetically pleasing to boot! Yeah… I’m pretty sure you have every spice IN THE WORLD. Haha. I’m printing this list for sure as I’m exploring “veganism”. Thank you so much for this post, Angela! I love your spice lazy susans – perfect for short people. I love living by Whole Foods! I actually find most products at WF in the southen usa to be cheaper than Safeway in Canada! I also found Bob’s GF oats there for $1 cheaper than Walmrt down the street! yes, we noticed that prices were a lot cheaper in the US, specifically California when we were visiting! What a great post! I’m not a vegan myself but I am really fond of raw food (does that make sense?) and this is such a great list! Thank you for taking time to put this together! Thanks Misha, I hope you find it helpful! Angela, has your answer to this question “1. What do you eat in a typical day/How many calories do you eat a day?” in the FAQ change? I love that you highlight buckwheat groats. I ate these A LOT when we lived in Russia (and then when I later lived in Ukraine). They’re so tasty — it seems strange they still haven’t caught on so well in the US market. I’ve never tried them raw, though. Thank you for yet another amazing and interesting post. I was about to suggest Nature’s Emporium http://www.naturesemporium.ca/ but I see that someone already has. Wonderful store (it’s big.. like a No Frills kinda big) and you have sooooo much in there. I shop there every week. The staff is super friendly and helpful if you have any question. You can even have a tour with a nutritionist who will help you find all the products you need. I wish I had known that the first time I went when we were told nearly overnight that we could not have wheat, gluten, corn, dairy, and refined sugar anymore. 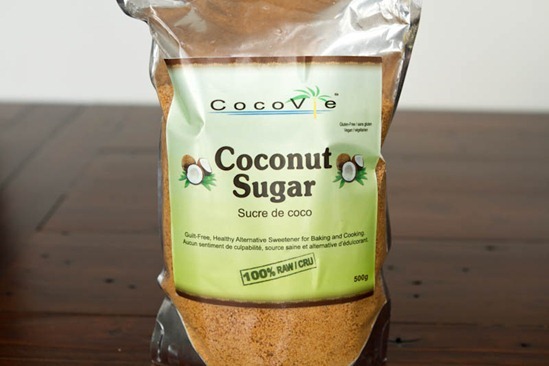 Re coconut sugar: LOVE it, and I use it mainly in all my baking (and I bake everyday) since we found out that refined sugar -particularly cane sugar – was the reason behind my son’s (monthly) nasty migraines. Did not know about Sucanat though, will have to find out more about it. Thanks again for everything Angela, LOVE your blog. I have the same problem about the follow-up comments via email! I did! Got this one, but it was in the spams. Previous ones never showed though, spams or not…weird. I’ve been following your blog for awhile now, but this is my first post. Thank you so much for your awesome recipes and for sharing your personal battles with food and body image…I teach psychology and gender studies at the high school level and I encounter sooo many kids with the same issues so many of us faced at their age regarding how they feel about themselves and how they look at food and health. I’ve been vegan for a few years now, and I have to say, your recipes and Oh She Glows, in general, has become my favorite source of info and inspiration. This post was a huge undertaking…thank you for taking the time!! Hey Jaclyn, Thank you for your comment! So nice to meet you. Your job sounds so interesting and I’m sure you are helping so many of your students. Thanks for your kind words about the blog, that means so much to me! Take care. Hi! I am starting a 30-day trial of vegan on Monday. I am only saying 30 days right now because I don’t want to set myself up for a lifestyle I can’t handle, and I want to track my results over those 30 days via my blog. I really like your blog, it has given me a lot of inspiration and I want to use a lot of your recipes. I don’t really know how to get started though! I am on a budget, and my husband doesn’t want to change his diet, which is fine by me, but I can’t spend hundred of dollars when I go shopping this weekend! I’m sure you have a post here and I just need to find it, but how can I get started in a healthy, complete way but on a budget? I absolutely love almond milk, but used soy for the longest time because it has protein. However, I recently found a So Delicious brand almond milk that has protein added! It has 5 grams, but 70 calories instead of 35. I’m not sure your reason for using almond milk, but the So Delicious one with protein is great! Now I have some extra protein in my Green Monsters! I have so many reasons to read your blog..and I thank you for all that you share!!! I have a question on the buckwheat groats (I had never ever heard of them before!) .. for your summer porridge recipe… does it have a gritty texture or am I doing something wrong, do you think? I had bought the toasted ones… now I know to buy the raw… so maybe that is why mine tastes pretty sandy? I liked it with raisins and pears on it anyhow! 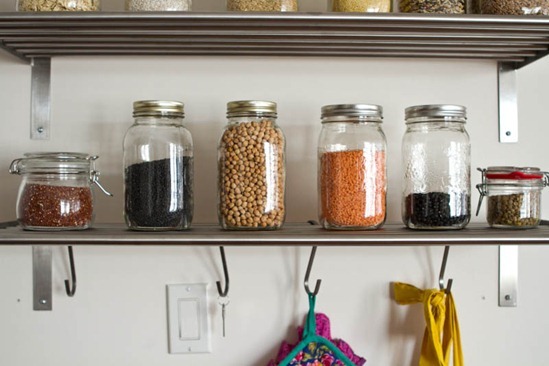 Also– after you prepare beans/lentils/grains.. do you store them in the refrig? Is there a rule of thumb timeframe on them? *My son asked if you talk about hotdogs on this food blog..he’s 5. Very funny! This is an amazing post. It really provides all the essentials to live a healthy vegan lifestyle. My favorite breakfast to this day is the raw buckwheat. Delicious. I need to incorporate more of these foods in my diet. I feel like I have fallen off the healthy vegan lifestyle and stuck to foods that are easy and repetitive. I think that’s an easy thing to do Meg! I’ve been feeling that way a bit too. What better time than spring to bring in the variety again, right? This post is so helpful and informative! Thanks for sharing. I’ve got some work to do on my pantry now! Such a helpful list! I also aspire to be as organized as you are! just wondering if you’ve tried Kombucha ?! I’m sure you know that it is a fermented tea beverage that has healthful probiotics …and may even help with your (occasional) tummy troubles. We have been brewing our own at home for a fraction of the cost of store bought brands. Super yummy!!! Maybe you could do a blog entry on your home brewing experiment :) The scoby (symbiotic culture of bacteria and yeast) is creepy looking and could make for some cool photos! Hi Angela. I’m a little late for commenting on this article but figure I’ll add some info. I live 3 hours north of Toronto so I come to the city and shop. Kensington is great. The two stores I can think of are Essence of Life and Tutti Frutti (not sure of the spelling). Supplements are a really good price too. I also buy from the onfc, and it’s nice they have monthly specials. I’ve also ordered from Upaya Naturals online. They specialize in raw items but they have a great selection, and things like nut butters. Also, noticed you buy your medjool dates at PC and not sure if you’re aware there’s an organic option too? I hadn’t heard about the brown rice syrup….that’s not good. It’s a full time job staying on top of everything! thanks for a great post. Jan.
Great article to get us started on the road to healthy eating. Just found your site today and will be coming back often. I also gave it a plug at my web site. Thank you so much for sharing what you have in your pantry, it makes it easier to decide what to start with. I took a cue from you also, I am using the foods I eat to decorate my kitchen, it clears up so much pantry space and it looks so pretty. Does anyone know if the bulk barn carries dairy free/vegan chocolate chips? I LOVE your recipes and ideas. From a new vegan, you make starting out on this journey not only possible, but exciting and inspiring. Thanks. I have one quick question. I have absolutley no idea what “Earth Balance” is?!?!? I think it’s linked in the post. It’s a vegan buttery spread made from oil. Thank you! I’m preparing for a drastic shift in eating habits for myself and my family. I love to cook and have always enjoyed eating my veggies, but feared I would really miss the “meat” in my diet, as many vegetarian recipes don’t have that “sink your teeth into” quality. Boy, am I glad I found your blog! Your gorgeous recipes are complex, fraught with fabulous flavor profiles and look so satisfying. I can’t wait to start our new journey toward lasting health! Thanks again! 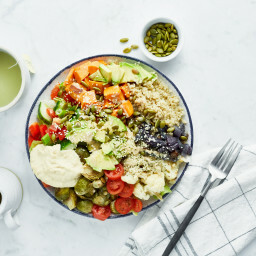 Kardish Health Food Centre in Ottawa, Nepean and Orleans (6 locations overall) have a great selection of vegan friendly foods. I love the way the pantry is organized. I am inspired to organize mine the same way. Thanks. Hi there, not sure if you have heard of Epicure. It is a supply company that sells spices and some baking tools. What i love about Epicure is that it is all natural, no additives, no preservatives, no added salt etc, and mostly kosher free! Its a great product. No, i don’t sell it myself, but i have been buying if for over 7 years now, and i don’t really go anywhere else for my spices. They are located on line, and they are a Canadian company! I was just wondering if you heard back from the company that makes the brown rice syrup you buy about the arsenic? Not yet, but I emailed them again and will post about it when I hear back about their study. I read that someone was looking for a good way to cook tofu, and I recently found one! I cut mine into about 8 strips per block of tofu (Trader Joe’s has a great one that has double the normal amount of protein and is extra firm, not very watery either.) Make sure you remove the excess moisture with paper towels if you like yours less squishy. You can marinade the tofu if you want for a couple of hours (braggs amino acids, garlic, tamari, whatever you feel like really.) I spray a cookie sheet with Pam cooking spray and put the tofu strips right on it an inch apart from each other. Bake on 425 degrees for 15 minutes, flip, cook for another 10 minutes. Done. So easy and they taste fried, without the calories and fat from frying. Yum! I live in the middle of nowhere so have to order most of my food on line, I love Vitacost.com and I use amazon.com. I was looking through your vegan pantry list (which, by the way, is absolutely amazing since you have all the stuff that I wish to have someday in my kitchen after college :) )…I was wondering, do you have a ‘food scale’ or do you just use standard measuring cups when baking and cooking?? Do you ever use Maple Sugar in your baking? Check out the Coombs Family Farms on amazon Most affordable I’ve found. Where can I find kelp granules? I live in Calgary AB and cannot find them at Planet Organic, and they’re not available on amazon.ca. LOVE your recipes! I’m not a vegan, but everything I have tried is delicious… And my husband likes them too! Love the way your pantry looks – mine looks similiar but I am using plastic containers that I get when I buy bulk items from Whole Foods. So, I was wondering if it is more important to use glass jars? Just stumbled across this list! I wanted to thank you so much for going into such detail about everything. I am on the journey of lacto vegetarian to vegan. I have to say that I’m pretty proud of myself though- in my early 20’s I was all about the Boca burger and prepared stuffs. Now I can whip up seitan with ease. Anyway, I have bought so many vegan cookbooks to incorporate vegan meals into my life but some wind up calling for things I didn’t have! Your list is so comprehensive and helps me so much. Thanks again! Hi ^_^ my bf and I have been flexitarians for a few years now and we are ready to make the full transition to vegan by taking the 30 day challenge and I am so flippin glad I found this post and your wonderful blog! Angela, thank you so much for this post! I’ve been vegetarian nearly all my life, and your blog has inspired me to move towards a vegan lifestyle. I used your pantry list to prep my grocery list for my quarterly shopping trip to Rainbow Co-op, San Francisco’s amazing all-vegetarian grocery store. It’s the size of a Wal-Mart, and the only non-vegetarian items are their single brand of fish oil capsules in their own sealed-off shelf :) Definitely worth a visit if you’re ever in the area! Happycow.net is an awesome resource no matter where you live (or travel). It has listings for natural stores, as well as vegetarian and vegan restaurants, all over the world. Descriptions list the contact information, hours of operation, and if the location is organic, raw, local, etc. Mum and I would have been lost without it when we drove to Texas this year. Hi Angela thanks so much for all of this great information! My husband and I just became vegan a month ago and have many of the ingredients you have in your pantry. We have also done a lot of research into harmful additives, and wanted to let you know what was in a couple of the products you reference above. You like Blue Diamond Almond Milk and Native Forest Coconut Milk…both of those have harmful additives like Guar Gum, Xanthan Gum and the worst one…Carrageenan, which is a known carcinogen. The “gums” cause digestive upset, and once I cleansed my body of these additives which are commonly found in yogurts and ice creams (I stopped eating them when I became vegan), my tolerance for them decreased. I ate some coconut milk ice cream made with guar gum and my system didn’t like it at all. One thing we do at home is make our own almond milk with our Vitamix, and I am going to try to make coconut milk this weekend from dried coconut. Almond Milk is easy to make with a cheesecloth and raw almonds, water, vanilla and agave syrup. Anyway, just wanted to let you know about some of the harmful additives in these products even though they are marketed as “healthy” alternatives to dairy. Sometimes you just have to make things yourself! I know this post is old, but I hope you wouldn’t mind answering some questions when you get the chance. Thank you in advance!! 1. Could you consider writing a post about the different types of sugars you use, like why you would use a type of sugar over the other another (e.g., using sucanat over turbinado) when making a certain baked good or cooking? I am also really interested in your promised post about coconut sugar! Thanks! 2a. I was wondering, what is wrong with soy? I noticed you said you use soy-free Earth Balance. 2b. Have you tried the other Earth Balance baking spreads/sticks (e.g., olive oil spread, coconut spread, shortening sticks, buttery sticks)? What did you think of the ones you tried? Do they have a strong olive oil/coconut oil taste? 2c. Have you tried Spectrum’s shortening tubs? How do they compare to Earth Balance? 3. Did you find that your nuts stored better in the freezer? I was scrolling through your comments, but I couldn’t find a follow-up regarding the freezer storage. 4. 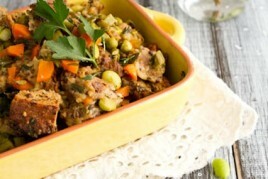 Do you cook your legumes/beans in batches, or do you make just enough for a recipe? I ask because I couldn’t find a post about how to cook beans and lentils. In the recipes I browsed with those ingredients, the ingredient lists them as already cooked, or from a can. Sorry for the myriad of questions! Thanks again for taking the time to answer. It’s really appreciated! I just wanted to say… YOU are friggin’ amazing! Thank you!!! Your site is such a blessing! Being a newly born wannabe vegan, this is the answer to my prayers! Thank you so much for laying it all out so beautifully. Thank you Pamela! Im so happy to hear that. I see that agave nectar is in your pantry…This is not a healthy food, I’m surprised you use it. 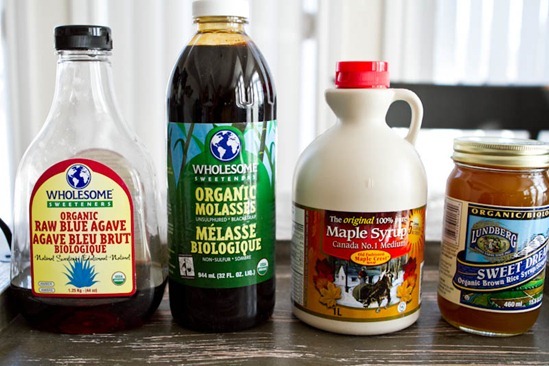 Thanks Lindy, I have since read the new info on agave and I do not use it much anymore, instead opting for maple syrup and coconut nectar for liquid sweeteners. Over the past few weeks I have started incorporating more plant based foods into my diet and it has been so much fun trying new recipes! I have really enjoyed researching the vegan diet and I feel amazing! Makes me wonder what the heck took me so long to make the change in my diet! As for my question, where do I find nutritional yeast at the grocery store or is this something only a natural foods store would have? I have looked in baking and the organic food section at our local Meijer and Kroger. Hey Valerie! Congrats on all your changes! :) Some grocery stores carry NY and some don’t. When they do carry it, it does tend to be in the natural foods/organic section. Otherwise, health food stores can have it too (or online of course). All the best to you! Hello. I’m an American undergrad student looking to restructure my diet. Specifically, a member of my family has systemic lupus, and I’m sure that improving our diet would help him feel much better from day to day. I’m going to do it with him so that he doesn’t feel like the odd man out. But I’ve hit a bit of a snag on the implementation of the transition. Do you have any specific advice about eating well on a budget? I was wondering where I can bulk buy vegan chocolate, especially for cooking. Stores here in the UK (Belfast) have those tiny snack size bags that aren’t really worth the cost. Anyone know of a site or what have you? Thank you so much for this great pantry list. Off to Trader Joes this week and looking forward to a total pantry makeover!! Just starting out. Love your Blog. 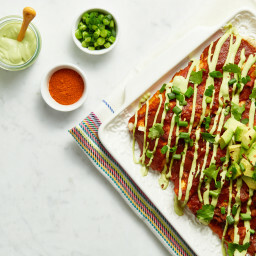 What do you use for your nutritional yeast, specifically in your enchiladas? Thank you! I use Purely Bulk brand, but really you can use any brand you prefer. This list is very useful. Going vegan is not easy, I thought I could try a few recipes here and there. I think overall, I want to aim for general good health and control my refined sugar cravings (processed stuff). When I read your bio, I was really inspired how you overcame an eating disorder and now you have a great food blog/website, filled with recipes and tips. Delicious! I am the happiest girl right now! 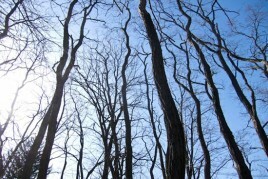 I just came across your blog and it is EXACTLY what I have been looking for! THANK YOU! Plus you are also Canadian what a plus hehe ^_^ Great pantry i need to build mine but also clear out my cupboards ! Love your website, I’ve made many delicious recipes from it! Thank you so much. Question: Do you have a recipe on how to make beans from scratch? Wonderful post! As a new vegan (day 2 today!) and as someone who loves cooking, I quite appreciate the good list of products. It’s kind of funny that I moved to Rome and became a vegan, but I am actually very excited about this new journey in food. I took a long walk around all of the local stores and it turns out there are lots of vegan friendly places here, but some items are going to be hard to find for sure. I really wish I knew where I could find coconut oil & maple syrup around here. Gladly, I have a good friend who is also a vegan and we spend lots of time together. I do hope she knows all of the right places, even though she only became a vegan 2-3 months ago. Anyone else from the Rome area? I am organizing my pantry for 2014! I just got out some jars that weren’t labeled and I am not sure what it is! (Not good) Thanks for the helpful tips and nice photographs. It helps to have the visual of an organized pantry and the aided tips of what to have on hand for everyday cooking adventures. I copied this entire list and added some notes as to what kind of benefits everything has! ***I came across a disturbing exposé recently about child trafficking and slavery in the Cocoa industry. None of the corporations will claim responsibility since they buy cocoa beans and mass from private plantations (wich use children to do the work). I dont know if your interested but look it up… I was a little disappointed because there’s not very many treats I can eat – unless homemade and now I’m having to source out free-trade cocoa. Thank you for this. I have been vegan for almost a week now and I have been looking for this type of list to stock my kitchen properly. Reading some comments, I realize some of you are missing a Bulk Barn (or any other bulk store) dearly. I think I can help! I’m currently reading Béa Johnson’s book/blog “Zero Waste Home”. Turns out, she buys most of her things (including food) in bulk. She lives in California and came up with an app literally called “Bulk” (it’s free, work with iPhone and Android). I’m in Montreal and it works fine: it did locate my local Bulk Barn! ;) If you’re living in the US and running out of “bulk options”, you might find some solutions with this app. It should be even more effective for you than it is for me, as most locations are in the US. I am part of a group of new healthy eaters and we are compiling a list of items for the new vegetarian or vegan to include in their pantry. Would you allow us to use your list and share it with our members. Thank you for posting such an amazing array of healthy foods. I love this post and find it extremely helpful to know what you keep stocked in your pantry! I am wondering if you could modify this list and maybe post a shorter version of staples. I am about to graduate from college and am moving into an apartment and would LOVE some help with my first trip to the grocery store! I’m motivated to make the transition to a vegan lifestyle, and what better time than when I have to start fresh anyway! What do you recommend for storage containers? I am diligently revisiting your cookbook and website in best efforts, again, to maintain a 100% plant based diet for myself and keen husband. Are you still using ‘Go BLO’ vegan bouillon? I can’t find it anywhere – please help! I have not found any bouillon product that appeals whether it have cornstarch or too much sodium – please advise and add where to purchase. BTW we are ‘young’ wannabe vegans, in our early sixties, in the midst of clearing out our cupboards and stocking with your recommendations – you make a vegan diet do-able and appealing – thanks for sharing your diet and your life journey. Namaste. @Jana, Better Than Bouillon makes a low-sodium vegetable version. You might try it. Bryanna Clark Grogan (genius vegan chef, cookbook author, and now blogger) also recommends Seitenbacher Vegetarian Vegetable Seasoning but I have not had a chance to try it. VegeBase gets good reviews — bought some but have only used it once so I don’t feel ready to make a judgment. Thank you for such a thorough and detailed list. You saved me just a lot of extra research (on brands). This could very well just be a shopping list. You rock! I’m also in Ontario, just interested to know where you like to purchase your nuts? Were you aware that Almond Breeze contains Carageenan which is cancer causing? Not sure if it’s been said yet but HyVee is a very vegan friendly store. They have a health foods section that has all of these raw sugars, nutritional yeast, milk-alternates, etc. Then (at least at my store) on the other side of the store is a huge selection of buy-in-bulk grains/seeds/nuts/granolas/legumes etc. They’re a little pricey but it’s convenient for sure. Especially since there really are no other options in my area except for online. Thank you so much for this list. As a new vegan this is *very* helpful! Hello, I just purchases brown rice syrup. Do you store that in the fridge after it is open or in the pantry? Does it expire? There is no indication on the label and I could not find any answer over the internet. Thank you. Hi, Angela! Just got my copy of your cookbook and am wondering what your favorite vegan “butter” is that doesn’t have soy or avocado oil in it. I’m allergic to dairy yet love cheese and butter. I have the vegan cheese options covered, but have yet to find a butter substitute I like that tastes almost as good as the real thing, which is important as I try to “sneak” non-dairy products into our kitchen repertoire. Thank You for creating such an organized and comprehensive list with great photos to boot! Thank you, for sharing your vegan pantry. Thanks so much for this list! I love how organized it is and as a new vegan I need all the help I can get. I’ve been “vegan” for about a week (meaning no obvious meat but still too many questionable ingredients in my cupboards), but I’m ready to do a complete pantry overhaul! The nearest Whole Foods is within reasonable driving distance so this list will be my guide to a “whole” new world, lol. 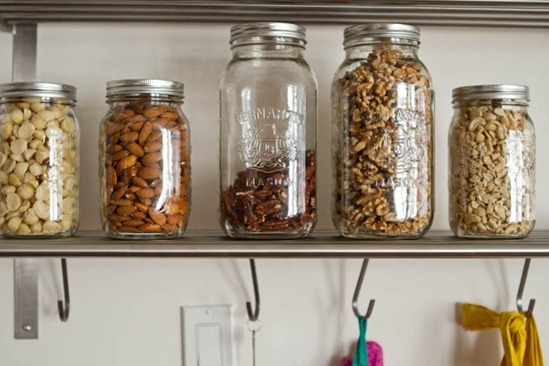 Do you store nuts in fridge at all? Or are they all in airtight containers in pantry?? Also do you use ground flax seed? I bought a large bag at Costco and I hate the strong flavour it imparts on my baking. Suggestions? Hey Liz, We buy nuts in bulk, a little at a time, and we go through them so fast we don’t tend to need to freeze them. But if I was going to buy larger quantities I would probably freeze them for longer storage. :) I hear you on ground flax…I find some brands of pre-ground flaxseed can have quite a strong flavour, almost as if it’s spoiled or gone rancid. I use Bob’s Red Mill brand when I don’t have time to grind my own. You can grind it in a blender and then store it in the freezer or fridge too. Next post: Online Vegan Shopping Guide: Canada, USA, Australia, UK, and Beyond!